Axial computed tomography scan in a patient without avascular necrosis of the femoral head shows prominent and thickened but normal trabeculae (arrow) within the femoral head. Note the delicate, sclerotic, raylike branchings emanating in a radial fashion from the central dense band. This is the asterisk sign. See also the next image. Avascular necrosis of the femoral head. Illustration of the normal circulation of the femoral head, viewed from the posterior approach. The posterior-superior retinacular arteries provide the major blood supply to the epiphysis. They traverse the femoral neck and are contained within the joint capsule and give rise to the lateral epiphyseal vessels at the junction of the femoral head and neck. From there, they penetrate the femur and supply the femoral epiphysis. A. = artery. Avascular necrosis of the femoral head. Illustration demonstrating that the blood supply to the femoral head is compromised by subcapital femoral fractures or slipped capital femoral epiphysis. As the epiphysis or femoral neck separates from the femoral head, the femoral metaphysis displaces superolaterally and the femur rotates externally. This causes the distal posterior-superior retinacular arteries and proximal lateral epiphyseal vessels to kink or rotate, compromising the blood flow to the epiphysis. 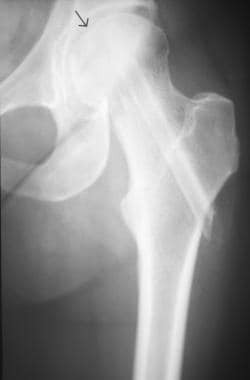 If this condition were to persist, the femoral head would be at high risk for developing avascular necrosis. Frogleg lateral view of the right hip in a patient with avascular necrosis shows the crescent sign, indicating subchondral fracture. Therapeutic interventions are less likely to halt progression of the disease once this sign appears. The frogleg lateral view is better than anteroposterior (AP) projection for demonstrating this sign, because the anterior and posterior margins of the acetabulum on the AP projection are superimposed over the superior portion of the femoral head, the usual location of the sign. The incidence of avascular necrosis (AVN) has been increasing. The causes include greater use of exogenous steroids and an increase in trauma. In 54-80% of renal transplant recipients in whom AVN is detected with plain radiographs, the disease is bilateral. It is estimated that almost 10% of the nearly 500,000 THRs performed each year in the United States are intended to treat AVN; at a cost of more than $1 billion, THRs performed to treat avascular necrosis of the femoral head constitute approximately 25% of the total national costs for THR. 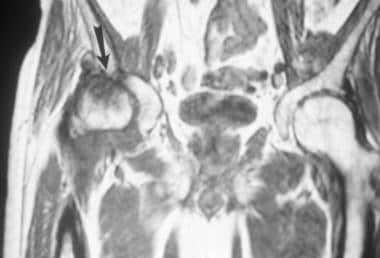 Trauma is the most common cause of avascular necrosis; however, nontraumatic AVN is commonly bilateral and occurs in younger persons. In addition, nontraumatic bilateral AVN usually occurs at different times and progresses at different rates in different hips. Treatment of AVN has been facilitated by the adoption of an international classification system, by effective early diagnosis using magnetic resonance imaging (MRI), and by more aggressive surgical management; nevertheless; no universally satisfactory therapy has been developed, even for early disease. Because measures to preserve the joint are associated with better prognoses when the diagnosis of avascular necrosis (AVN) is made early in the course of the disease and because the results of joint replacement therapy are poorer in younger age groups than in older patients, it is critical to diagnose this condition as early as possible to prevent or delay progression of the disease. Avascular necrosis is characterized by areas of dead trabecular bone and marrow extending to involve the subchondral plate. 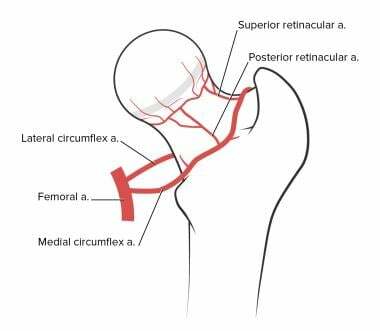 The anterolateral aspect of the femoral head, the principal weightbearing region, is typically involved, but any region of the femoral head may be involved. 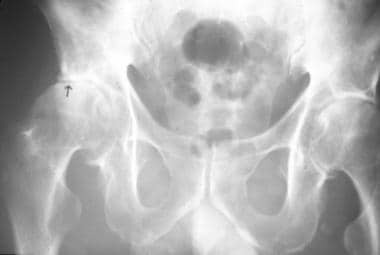 In the adult, the involved segment usually never fully revascularizes, and collapse of the femoral head usually occurs sometime after AVN is detected radiographically. The femoral head is the most vulnerable site for the development of avascular necrosis. The site of necrosis is usually immediately below the weightbearing articular surface of the bone (ie, the anterolateral aspect of the femoral head). This is the site of greatest mechanical stress. Elderly persons are at decreased risk for developing avascular necrosis. Fat cells become smaller in elderly persons. The space between fat cells fills with a loose reticulum and mucoid fluid, which are resistant to AVN. This condition is termed gelatinous marrow. Even in the presence of increased intramedullary pressure, interstitial fluid is able to escape into the blood vessels, leaving the spaces free to absorb additional fluid. To understand the changes of avascular necrosis on radiologic studies such as computed tomography (CT) scanning and MRI, it is necessary to understand the anatomy of the hip and to understand the vascular anatomy of the hip in children. The hip is a ball-and-socket joint. The acetabulum, which provides bony coverage of 40% of the femoral head, has a horseshoe-shaped lunate surface. The femoral head is round and smooth in all imaging planes. The fovea capitis, a small depression on the medial femoral head, is the site of attachment of the ligamentum teres (see the image below). 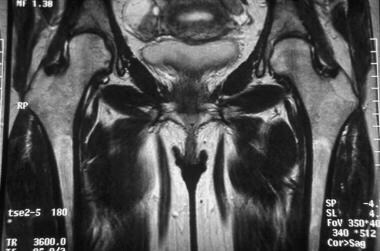 Coronal T1 MRI of the pelvis and hips in a patient without avascular necrosis of the femoral head. A thin low-signal line, representing the long cortex, surrounds the femur and iliac lines. The fovea is a small indentation along the medial aspect of the femoral head and is the site of penetration of the artery of the ligamentum teres into the femur. High signal is present within the medullary space of the proximal femur, representing normal fatty marrow. The physis is a thin line of low signal extending from the lateral to the medial aspect of the femoral head. The LEV enters the femoral head within a 1-cm-wide zone between the cartilage of the femoral head and the cortical bone of the femoral neck. They supply the lateral and central thirds of the femoral head. When patent, the artery of the ligamentum teres (ALT) supplies the medial third of the femoral head. Branches of the LEVs and the ALT anastomose in the junction of the central and medial third of the femoral head. The thickest part of the articular cartilage of the femoral head is located along the posterior-superior aspect and measures 3 mm in diameter. It thins to 0.5 mm along the peripheral and inferior margins. In children 4-7 years of age, the vascular anatomy of the proximal femur is in a transitional stage of development. The ALT does not penetrate the epiphysis of the femoral head until age 9 or 10 years. The medial circumflex artery, a branch of the profunda femoris artery, penetrates into the femoral proximal metaphysis but is prevented from passing into the femoral epiphysis by the growth plate. The blood supply to the femoral head is especially vulnerable during this time. 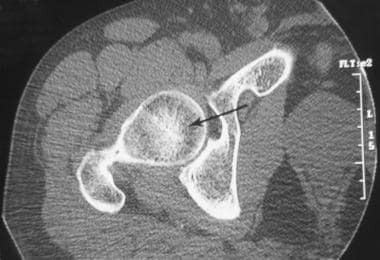 Physiologic thickening of bone trabeculae in the center of the femoral head is present and appears similar to a star, which is termed the asterisk sign (see the image below). The configuration is related to the stress of weightbearing. Sclerotic raylike branches of the star usually extend to the upper surface of the femoral head (see the image below). A dense line, extending from the lateral to the medial portion of the mid femoral head, represents the fused epiphysis. Fatty marrow is present in the femoral capital epiphysis and the greater trochanter of all individuals older than 2 years. Fatty marrow has high signal intensity on T1-weighted images (T1WIs) and T2-weighted images (T2WIs) (see the images below). Hematopoietic marrow, when present, is found in the femoral neck, the intertrochanteric region, and the acetabulum. It has low signal intensity on T1WIs and high signal intensity on T2WIs (see the images below). Avascular necrosis of the femoral head. Coronal T1-weighted magnetic resonance image in a patient showing hypointense signal within the proximal femoral neck and intertrochanteric regions (arrows) representing hematopoietic marrow. Increased signal is present within the greater trochanters and femoral capital epiphysis representing normal fatty marrow. See also the next image. Avascular necrosis of the femoral head. Coronal T2-weighted magnetic resonance image in a patient showing hypointense signal within the proximal femoral neck and intertrochanteric regions, representing hematopoietic marrow. Increased signal is present within the greater trochanters (single arrowhead) and femoral capital epiphysis (stars), representing normal fatty marrow. The normal hip joints (double arrowheads) contain a small amount of fluid. The medullary cavity contains prominent vertically oriented linear striations of low signal on all imaging sequences extending from the inferolateral aspect to the superomedial aspect of the femoral head. These represent the weight-bearing trabeculae and are analogous to the asterisk sign seen on CT scans. The medullary cavity is surrounded by a sharply marginated line of low signal intensity, which represents the cortex of the bone. Cortex and trabeculae have weak MRI signal intensity because of a low concentration and decreased mobility of hydrogen ions (see the 2 images above). A thin line of high signal intensity, which represents the articular cartilage, surrounds the outer margin of the femoral head. A curvilinear low-signal line, representing the physis, crosses the marrow of the femoral neck laterally to medially. The medullary cavity of the iliac bone, adjacent to the acetabulum, is of slightly lower and less homogeneous signal intensity than the femoral head (see the 2 images above). Avascular necrosis progresses from minimal to more severe disease to mechanical failure. If the vascular area is small and is not adjacent to an articular surface, the patient may be asymptomatic; healing may occur spontaneously, or the disease may remain undetected or be discovered incidentally during workup for other conditions. Once AVN develops, repair begins at the interface between viable bone and necrotic bone. Ineffective resorption of dead bone within the necrotic focus is the rule. Dead bone is reabsorbed only partially. Reactive and reparative bone is laid down on dead trabeculae, resulting in a sclerotic margin of thickened trabeculae within an advancing front of hyperemia, inflammation, bone resorption, and fibrosis. The incomplete resorption of dead bone has a mixed sclerotic and cystic appearance on radiographs. Necrosis and repair are ongoing in various stages of evolution within a single lesion. Mechanical failure of trabecular bone at the interface between dead and viable bone may exacerbate avascular necrosis. In the subchondral region, such microfractures do not heal because they occur within an area of dead bone. Progression of the microfractures results in a diffuse subchondral fracture, seen radiographically as the crescent sign (see the first image below). Following subchondral fracture and progressive weightbearing, collapse of the articular cartilage occurs (see the second through fifth images below). Continued fracture, necrosis, and further weightbearing may progress to degenerative joint disease (DJD) and joint dissolution (see the second image and last 2 images below). Avascular necrosis of the femoral head. Anteroposterior view of the pelvis shows flattening of the outer portion of the right femoral head from avascular necrosis (arrow), with adjacent joint-space narrowing, juxta-articular sclerosis, and osteophytes representing degenerative joint disease. See also the next image. Anteroposterior view of the left hip in a patient with avascular necrosis obtained 6 months after presentation shows that the patient has undergone core decompression but has developed mild flattening of the femoral head, indicating progression of disease despite treatment. Plain film finding in a patient with bilateral avascular necrosis of the femoral head 6 months after presentation demonstrates that subtle flattening of the left femoral head (open arrow) has occurred. This indicates progression of disease from stage 2 to stage 3 despite conservative treatment. The patient underwent bilateral core decompression and bone grafting. The defects within the proximal femurs represent removal of the dead bone, and the tubular densities within each femur represent bone grafts in an attempt to revascularize the region of avascular necrosis. Plain film findings in a patient with bilateral avascular necrosis of the femoral head who underwent bilateral core decompression and bone grafting. Despite treatment, an anteroposterior plain film of the pelvis obtained 6 months later shows further flattening of the right femoral head (black arrows). Note the progressive increase in the size of the lucency within the right femoral head, which resulted in further weakening of the femoral head. This lucency represents removal of dead bone. Once fracture of the femoral head occurs, operative attempts to stabilize the femur usually fail. Disease usually progresses rapidly, requiring total joint replacement. Axial computed tomography scan in a patient with avascular necrosis. This image shows joint space narrowing, juxta-articular sclerosis, and osteophyte formation (degenerative joint disease) around the anteromedial and posterolateral aspects of the right hip. Anteroposterior plain film of the pelvis in a patient with avascular necrosis of the femoral head shows asymmetric joint-space narrowing (arrow), juxta-articular sclerosis, and subchondral cyst formation around the right hip secondary to degenerative joint disease. This may be confused with avascular necrosis, but the intimate localization of all of the bindings and the absence of femoral head collapse makes a diagnosis of avascular necrosis highly unlikely. This section will discuss various imaging modalities. For more detailed information, please see their respective sections in this article. 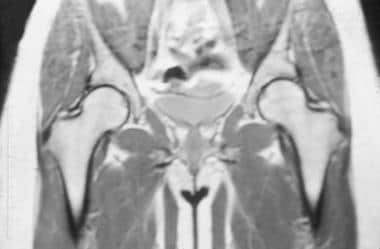 MRI is the most sensitive means of diagnosing avascular necrosis. This imaging modality provides the criterion standard of noninvasive diagnostic evaluation and is more sensitive than CT scanning or planar scintigraphy. In addition, MRI is much more sensitive than plain film radiography for detecting avascular necrosis (AVN). However, low-field magnets (0.1 Tesla [T]) are not as sensitive for diagnosing AVN. 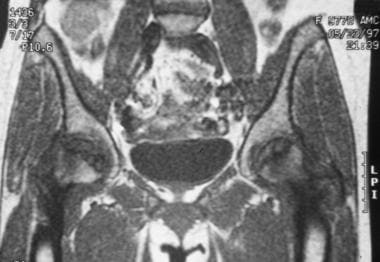 MRI is indispensable for the accurate staging of avascular necrosis, because images clearly depict the size of the lesion, and gross estimates of the stage of disease can be made. MRI allows sequential evaluation of asymptomatic lesions that are undetectable on plain radiographs. MRI facilitates better response to treatment because, with the use of MRI, AVN is diagnosed at an earlier stage, and therapeutic measures are more successful the earlier they are begun. MRI does not employ ionizing radiation—a factor that is especially important in the growing skeleton—and it is accepted widely and is easy to perform. MRI is also capable of imaging in multiple planes (ie, axial, sagittal, coronal, or any variation thereof), demonstrates superior soft-tissue resolution, and has high spatial and contrast resolution, allowing evaluation of morphologic features. Similar sensitivity and specificity were found between low-field MRI and planar radionuclide bone scanning. At high magnetic field strength, MRI has a higher sensitivity than radionuclide scanning. Using a 1.5-T magnet, Beltran et al reported 88% sensitivity, 100% specificity, and 94% accuracy with MRI and 78% sensitivity, 75% specificity, and 76% accuracy with bone scintigraphy. The high sensitivity of MRI has been confirmed by others. In another study, MRI performed at 0.6 T and single-photon emission CT (SPECT) bone imaging using technetium-99m (99mTc) methylene diphosphonate (MDP) were similarly effective in diagnosing avascular necrosis. MRI had a sensitivity of 87% and a specificity of 83%; whereas SPECT scanning had a sensitivity of 91% and a specificity of 78%. Both were more effective than planar bone scintigraphy, which had a sensitivity of 83% and a specificity of 83%. 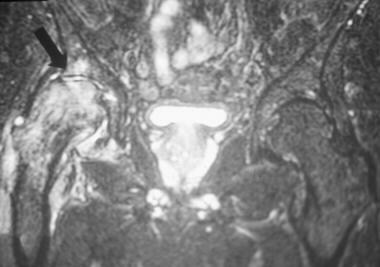 MRI was also more effective than SPECT for diagnosing cases of avascular necrosis (AVN) of the hip in which pain was absent. 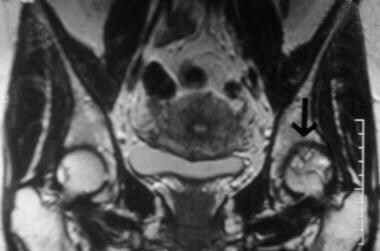 MRI detected avascular necrosis (AVN) in 10 of 15 patients, but SPECT scanning detected AVN in only 5 of 15 patients. Using receiver operating characteristic (ROC) curves, MRI was better than CT scanning by more than 2 standard errors and better than radionuclide scanning by more than 3 standard errors in helping diagnose early AVN. Collier reported a sensitivity of 55% with planar radionuclide imaging for AVN. However, bone scintigraphy equipped with a pinhole collimator has greater sensitivity for diagnosing AVN than bone scintigraphy using a high-resolution parallel-hole collimator. The pinhole collimator is a conical collimator with a small circular aperture (3-5 mm) that produces an inverted image of the object in a manner analogous to photographic cameras. The image obtained is magnified, allowing better visualization of small structures and improving detection of scintigraphic abnormalities. The pinhole collimator optimizes resolution in the evaluation of circumscribed areas, and the acquisition time is only 15 minutes, compared to up to 45 minutes for SPECT scanning. The technique is an alternative to MRI when MRI cannot be performed or when MRI results are not clear-cut. The high spatial resolution and contrast resolution of CT scanning allow analysis of morphologic features (see the images below), and the sensitivity of CT scanning in detecting early avascular necrosis is 55%, which is similar to the sensitivity of planar nuclear medicine imaging. Thus, CT scanning is more appropriate in evaluating the extent of involvement, such as subchondral lucencies and sclerosis during the reparative stage, before the onset of femoral head collapse and superimposed degenerative disease. Coronal multiplanar reconstructed computed tomography image in a patient without avascular necrosis of the femoral head. Thickened trabeculae are seen at the medial aspect of the junction of the femoral head and neck and extend to the subchondral region. The physis (arrowhead) is a transverse white line located between the lateral and medial aspect of the femoral head. Axial computed tomographh scan of a patient with avascular necrosis of the femoral head shows clumping and distortion of the central trabeculae representing the asterisk sign (arrowhead) and an adjacent low-density region (arrow) representing the reparative zone. See also the next image. Axial computed tomography (CT) scan of a patient with avascular necrosis of the femoral head shows a fracture to the anterior aspect of the femoral head. This finding was demonstrated on an axial fat-saturated T2-weighted magnetic resonance image, but it is delineated more clearly using CT scanning because of the superior resolution of CT scanning. See also the next image. CT scanning is better able to help define the extent of disease at stages II and higher than MRI and plain film radiography. CT scanning enables detection of subchondral or cancellous fractures and collapse, especially when multiplanar reconstruction is used. This information is essential for planning treatment (see the third and fourth images above). Although unable to detect disease of stage 0 or 1, plain film radiography may be helpful in assessing flattening of the femoral head and associated degenerative changes (see the images below). Anteroposterior view of the pelvis in a patient with bilateral avascular necrosis of the femoral head. 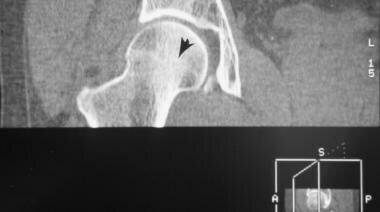 Mild flattening to the superior aspect of the right femoral head (open arrow) indicates stage 3 disease. The left femoral head has a normal contour, indicating stage 2 disease. The black arrows indicate the margins of the reparative zone, representing new bone formation on dead trabeculae. When avascular necrosis is bilateral, it usually occurs in each hip at different times, and the staging of disease in each hip can be, and often is, at different stages. See also the next image. Bone biopsy analysis has been rarely reported to be positive when MRI findings are normal. MRI cannot be performed in patients who have cardiac pacemakers or when intracranial clips are present, nor can MRI be performed in patients who have claustrophobia. In addition, problems related to malpositioning may lead to misrepresentation. 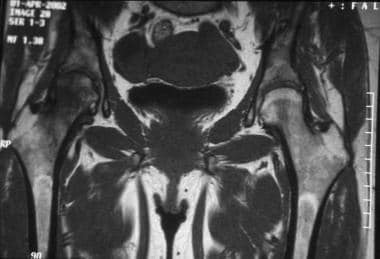 In children, slight pelvic obliquity may cause the normal dark-appearing growth plate to appear in the same axial cut as the contralateral bright-appearing epiphysis; in such cases, the normal growth plate may appear to be abnormal on MRI. Children may require sedation as a result of the long imaging times that MRI requires. 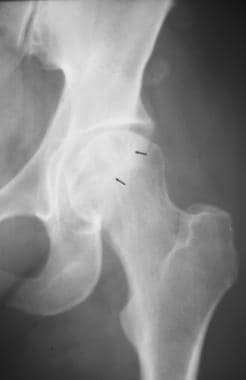 It may be difficult to detect AVN after surgery to repair a hip fracture because of the presence of orthopedic hardware, which creates significant image distortion. Marrow cells are more resistant to ischemia than hematopoietic cells or osteocytes. Because MRI images reflect changes within marrow fat signal intensity, MRI findings of avascular necrosis may not be seen for up to 5 days after the ischemic event, until the marrow fat cells have died. In this situation, contrast-enhanced MRI is needed. SPECT scanning demonstrates poor spatial resolution. Artifacts from the bladder are frequently encountered; these artifacts may obscure the photon-deficient region of the femoral head. A number of techniques, such as the use of multihead cameras with shorter acquisition times that improve resolution and increase sensitivity, have been advocated, but none has gained universal acceptance. SPECT imaging requires a cooperative patient who must remain immobile for up to 45 minutes of acquisition time; thus, this modality is difficult to use in children because of the necessity to remain motionless for long periods of time. Children may require sedation. In addition, diagnosing Legg-Calve-Perthes (LCP) in small children may be difficult because of the small size of the femoral epiphysis and associated bladder artifacts. Bone scan of a patient with avascular necrosis of the femoral head shows increased uptake in the superolateral aspect of the right femoral head, indicative of avascular necrosis but providing little information concerning the structural integrity of the hip. Planar bone scan of the pelvis in a patient with bilateral avascular necrosis of the femoral head shows marked increased uptake of radiopharmaceutical agent in both hips. Artifacts from radioactivity in the bladder are frequently encountered, obscuring the photon-deficient region. Entities causing increased uptake about the hip joint, such as arthritis and inflammatory disease, may obscure the photopenic necrotic focus within the femoral head. Results can be judged only by comparison with the other hip and may be of little use in the presence of bilateral involvement. Although CT scanning may delineate subtle alterations of bone density when plain radiograph findings are normal, MRI and SPECT scintigraphy are much more sensitive for evaluating early manifestations of the disease, such as bone marrow edema. 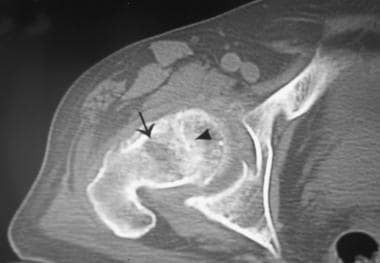 CT scans are insensitive for detecting stage 0 and 1 avascular necrosis, but they are excellent for detecting femoral head collapse, early degenerative joint disease (DJD), and the presence of loose bodies. CT scanning may improve the accuracy of radiographic staging using thin-slice thicknesses of 1 mm or less and by incorporating multiplanar reconstruction. In one study, 30% of hips with stage 2 (precollapse) AVN, evaluated with plain film radiography, had stage 3 disease when evaluated with CT scans. Using plain film radiography, the sensitivity for detecting early stages of the disease is as low as 41%. Plain film does not detect stage 0 and 1 avascular necrosis. A delay of 1-5 years may occur between the onset of symptoms and the appearance of radiographic abnormalities. Normal radiographic findings do not necessarily mean that disease is not present. Demineralization of the femur may be detected, and the disease may be suggested only after bone resorption has occurred. If early diagnosis is needed for the prompt initiation of therapy, more sensitive imaging methods (ie, MRI) must be used, especially in patients who are at increased risk for AVN. Diagnosing AVN as early as possible is imperative for a greater chance of success of conservative treatment. Patients who are at high risk must be screened using MRI. 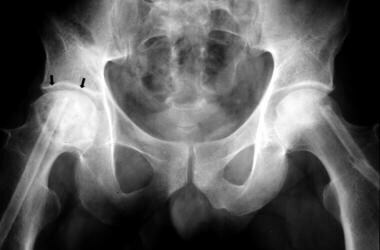 Normal radiograph findings do not mean a normal hip. Failure to pursue this condition with more aggressive imaging in a high-risk population can potentially lead to medical malpractice. MRI has replaced bone marrow pressure, venography, and bone biopsy. These are invasive procedures that were highly sensitive and specific for diagnosing avascular necrosis. They should be performed only when a high index of suspicion is present and all tests are equivocal. Avascular necrosis can be suggested only if it has already been diagnosed in the contralateral hip. Since the advent of MRI, stage 1 AVN is defined by normal findings on radiographs and positive findings on MRI or bone scintigraphy. Stage 1 represents the early resorptive stage. Late in this stage, plain radiographs may show minimal osteoporosis and/or blurring and poor definition of the bony trabeculae. Osteoporosis appears when one third of the mineral content of bone has been lost. Stage 2 avascular necrosis represents the reparative stage before flattening of the femoral head occurs and may extend for several months or longer. Demineralization is now evident; it is the first manifestation of the reparative stage, represents resorption of dead bone, and may be generalized or patchy or appear in the form of small cysts within the femoral head. Patchy sclerosis represents apposition of new bone on dead trabeculae and appears after demineralization develops, usually in the superolateral aspect of the femoral head (see the images below). However, patchy sclerosis usually coexists with demineralization, appearing as alternating regions of increased density and increased lucency. On radiographs, patchy sclerosis appears as increased density and may be diffuse, focal, or in a linear arc, which is concave superiorly. The pattern demonstrates alternating areas of lucency and sclerosis. Anteroposterior view of the left hip in a patient with avascular necrosis demonstrates alternating regions of the sclerosis and lucency within the superior aspect of the left femoral head (arrows), representing the reparative stage (stage 2) of avascular necrosis. The lucent areas represent the site of resorption of necrotic marrow and trabecular. The sclerosis represents apposition of new bone on dead trabeculae. In stage 3 avascular necrosis (AVN), a linear subcortical lucency, representing a fracture line, is present immediately beneath the articular cortex and may extend into the articular cartilage at the superolateral aspect of the femoral head. This is termed the crescent sign and is best demonstrated on a frogleg view (see the images below). The subarticular cortex may remain attached to the cartilage and is separated from the underlying femur by soft tissue, termed the eggshell sign. The femoral head initially preserves its round appearance, but later, it demonstrates collapse. This may be indicated by joint-space widening. An anteroposterior pelvic radiograph of a patient who complained of a short onset of right hip pain showing flattening of the superolateral aspect (the weightbearing portion) of the right femoral head. There is a crescent-shaped density (arrow) representing the femoral head surface on an underlying zone of decreased density underneath the crescent-shaped bone representing demineralization. Such findings indicate advanced disease and are associated with poor outcomes. Further flattening of the femoral head occurs with loss of its smooth convex contour in stage 4 avascular necrosis (AVN) (see the following image). Ultimately, the superior femoral fragment, representing the articular surface and the immediate subchondral bone, may become separated from the underlying femoral head or depressed and compacted into the femoral head. Fragments of bone and cartilage may separate from the underlying femur, roam freely within the hip joint, and become loose bodies. Severe collapse and destruction of the femoral head leads to progressive degenerative joint disease (DJD) with joint-space narrowing, marginal osteophyte formation, and subchondral cyst formation. Subchondral cysts can usually be differentiated from the alternating sclerosis and the lucency of the reparative stage of avascular necrosis. Atypical radiographic findings are seen in 18% of patients and those on steroid therapy. These findings consist of early joint-space narrowing, often before the appearance of the crescent sign. Unless the physician holds a high index of suspicion for AVN, an incorrect diagnosis of osteoarthritis will be made. Furthermore, signs of bone repair (sclerosis) may be absent; the first radiologic manifestations may be the subchondral lucency representing fracture of the dead bone. Atypical findings occur because bone formation is decreased in the presence of normal bone resorption; in this situation, increased density within the femoral heads usually is a result of flattening from fracture and compression of the femoral head. This stage is both preclinical and preradiologic. Most patients with stage 0 disease are identified when imaging is performed to evaluate avascular necrosis (AVN) in the contralateral hip or to exclude other diseases. Abnormal MRI findings, normal radiographic findings, and normal bone scan findings are features of stage 0. 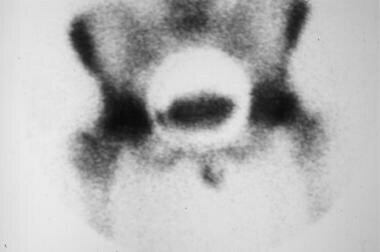 Stage 1 avascular necrosis demonstrates normal radiographic findings or shows minimal demineralization or blurred trabeculae. 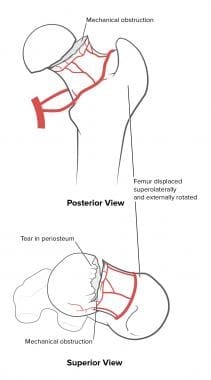 Pain in the anterior groin or thigh is common. Limited range of motion (ROM) in the hip may be present. 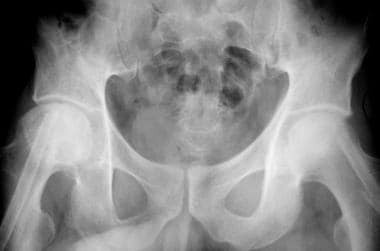 Abnormal bone scan findings, mild groin pain, and normal radiographic findings are features of stage 1. This stage shows diffuse or localized areas of sclerosis, lucencies, or both within the femoral head. Clinical signs persist or worsen. Osteoporosis, groin pain, and mottled sclerotic and/or cystic areas are features of stage 2 AVN. Stage 3 AVN is characterized by the crescent sign (subchondral fracture). A crescent line, pain with subchondral fracture activity, and no femoral head flattening are features of stage 3. This stage demonstrates marked collapse and fracture involving the articular surface. Segmental flattening of the femoral head demonstrates an out-of-round appearance. Thus, segmental flattening, pain with femoral head activity, no acetabular involvement, and normal joint space are features of stage 4 AVN. Stage 5 AVN is characterized by the development of DJD. Thus, joint space narrowing, resting pain, and acetabular degeneration (DJD) are features of stage 5. The Association Research Circulation Osseous (ARCO) of the Toulouse, France-based Association Internationale de Recherche sur la Circulation Osseuse has proposed a further classification of the various stages of avascular necrosis (AVN), which incorporates the percentage (area) of involvement of the femoral head and the location of the lesion. In addition, the extent of the AVN lesion is an important determinant of both clinical and radiologic outcomes. Three types of involvement have been identified: mild, moderate, and severe. In mild disease, less than 15% of the femoral head involvement is noted, which is less likely to demonstrate radiographic progression or require hip prosthesis. In moderate disease, the femoral head involvement ranges from 15 to 30%. In severe disease, the femoral head involvement is greater than 30%. Moderate and severe involvement are more likely to progress radiographically to degenerative disease and to require hip prosthesis placement. Demineralization is a nonspecific finding seen in a large number of different diseases. Such a finding needs further evaluation using MRI to evaluate for avascular necrosis. This feature is characteristic of stage 2 disease avascular AVN. Rarely, this finding is confused with entities such as chondroblastoma, a radiolucent cartilaginous tumor that contains calcium and is located in the epiphyseal region. If there are questions concerning the presence of the disease, MRI is recommended. If not, treatment can be initiated. DJD with degenerative spurring and joint space narrowing with subchondral cyst formation may mimic avascular necrosis. Subchondral cysts are usually immediately adjacent to areas of joint-space narrowing and osteophyte formation. MRI is usually diagnostic in problematic cases. Rarely, biopsy may be needed for differentiation. Some radiologic features of avascular necrosis may lead to false-positive findings. Poorly defined radiolucent lesions may simulate the bone destruction seen in malignancy, osteomyelitis, and transient osteoporosis of the hip (TOP). For malignancy and osteomyelitis, the history may be helpful. Demineralization can be seen in a number of different diseases, including TOP. TOP is self-limiting and resolves within 4-10 months. Radiologic resolution lags behind clinical improvement by 4-8 weeks, at which time radiographic findings revert to normal. The healing and reparative phase may mimic bone sarcoma. The later stages of AVN, which are characterized by joint-space narrowing, articular cartilage destruction, and alternating areas of lucency and sclerosis within the femoral head, may mimic DJD with subchondral cyst formation (see the following images). Sclerosis adjacent to an insufficiency fracture is an important differential, especially in patients who are osteopenic and are taking steroids. CT scans do not demonstrate the early vascular and marrow abnormalities that result in osteonecrosis. In fact, osteoporosis is the first visible CT scan sign of avascular necrosis. Later, the central bony asterisk is distorted, appearing as clumping and fusion of the peripheral asterisk rays. Clumping appears as spots or as hyperdense "roads" of various width (see the following image). This represents changes in the sclerotic interface between necrotic and viable bone and is analogous to the line of low signal surrounding the necrotic bone seen on MRI images. Early signs are caused by microfractures resulting from reduced mechanical load of dead bone trabeculae, altering the shape of the asterisk and are related to new bone formation on the dead trabeculae. The lucent cystic region, representing the reparative zone, may be appreciated (see the image above). Osteoporosis, whether diagnosed using plain film radiography or CT scanning, must be evaluated further, because it is present in a great number of diseases. MRI findings are usually diagnostic. Unless the asterisk sign is appreciated, articular surface abnormalities may be interpreted as DJD. The lucency within the reparative zone may be confused with malignancy, infection, insufficiency fracture, or plasma cell myeloma. Because both hips are often involved in AVN and because the condition is silent early in the course of the disease, use of a body coil and a large field of view (30-40 cm) is necessary to image both hips simultaneously. Surface coils, including shoulder coils, flexible coils, and phased-array coils, may provide additional resolution for individual hip joints in selected patients. T1WIs and T2WIs are obtained in the coronal plane, 4-mm thick, with a 1-mm gap. Fast spin-echo (FSE) images with fat saturation may also be obtained. Short tau inversion recovery (STIR) images provide excellent fat suppression and demonstrate areas of bone marrow edema (see the images below). STIR images may be obtained using FSE techniques with an echo train length of 8-16. This helps reduce lengthy imaging times associated with STIR imaging. Coronal fat-saturated T2-weighted magnetic resonance image in a patient with avascular necrosis shows increased signal within the femoral head and neck (arrow), representing edema. Short tau inversion recovery (STIR) and fat-saturated imaging are excellent for demonstrating this finding. See also the next image. Axial fat-saturated T2-weighted magnetic resonance image in a patient with avascular necrosis demonstrates a joint effusion (arrow) and the extensive abnormal increased signal representing edema within the femoral head. A fracture in the anterior aspect of the femoral head is present. See also the next image. Coronal T1-weighted magnetic resonance image (MRI) in a patient with avascular necrosis shows decreased signal within the femoral head (arrow), representing edema. 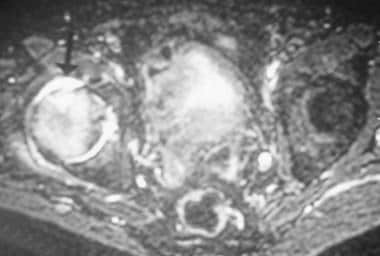 This is an MRI class C lesion. The subchondral abnormality can also indicate a fracture. Multiplanar reconstructed computed tomography scanning would be helpful for further investigation. A frequency selective pulse may be added to suppress the fat signal. When applied, the inner bright line on T2WIs is visualized, but the dark outer peripheral band is not seen. Nevertheless, FSE T2WIs with fat suppression are useful in demonstrating the extent of marrow edema associated with AVN. 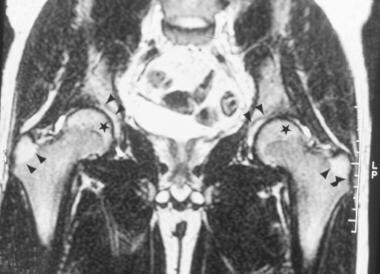 Rapidly acquired MRI sequences can reliably reveal the presence of avascular necrosis. These rapid screening sequences reduce or eliminate artifacts caused by patient motion. Coronal 2-dimensional (2-D), fast, low-angle shot (FLASH) T1WIs are performed using repetition time (TR), 174.9 milliseconds (ms); echo time (TE), 4.1 ms; flip angle, 70°; 4-mm slice thickness with 20% interslice gap; matrix, 172 × 256; number of signal acquisitions, 1; and imaging time, 39 seconds (s). Axial fat-suppressed FSE T2WIs are performed using TR, 3500 ms; TE, 138 ms; echo train length, 29; 6-mm slice thickness with 25% interslice gap; matrix, 116 × 256; number of signal acquisitions, 1; and imaging time, 16 s.
Chemical shift imaging may be used to detect premature fatty marrow conversion associated with AVN. Fatty and hematopoietic marrow and the distribution of water within the ischemic focus can be differentiated on fat-selective and water-selective images. Gradient-echo images are not as sensitive for fluid within reparative tissue, but they can demonstrate joint effusions, subchondral fluid, and changes in the contour of the articular cartilage. NOTE: Screening for avascular necrosis using T1WI only reduces specificity, may fail to identify a transchondral fracture, and may not help diagnose other diseases in which clinical presentation may mimic AVN, including transient osteoporosis. Khanna et al described a limited magnetic resonance examination using coronal T1WIs, in which MRI introduction earlier in the diagnosis of femoral head osteonecrosis, as well as its more widespread use in patient care, may be allowed because of the time and the potential cost reduction achieved with a limited examination. The investigators also reported excellent agreement between the full and the screening MR examinations for both detecting and determining the extent of osteonecrosis. In the Khanna study, only one case of AVN was missed in 29 patients, and the time required for the limited exam was 10 minutes relative to the 30 minutes required for the full examination. Without calculating the professional component, relative costs of the screening evaluation was $104, whereas the full assessment was $312. However, other diseases causing hip pain (eg, myositis, greater trochanteric bursitis, labral cysts, and fractures) that were located distant from the femoral heads were missed when T2WIs were not obtained. Perhaps there may be a role for the limited exam in following up bone marrow edema in asymptomatic patients. A peripheral band of low signal is present in the superior portion of the femoral head outlining a central area of bone marrow. This is considered to represent the reactive interface between the necrotic and reparative zones and extends to the subchondral bone plate (see the images below, 2 of which are followed by T2WI images in the same respective patients). Coronal T1-weighted magnetic resonance image of the pelvis in a patient with avascular necrosis of the left femoral head shows a mixed pattern of abnormal signal within the femoral head. The medial aspect consists predominantly of high signal representing blood. The superior portion demonstrated low signal, representing edema. In this patient, the dominant signal is edema. Coronal T1-weighted magnetic resonance image of the pelvis in a patient with bilateral avascular necrosis of the femoral head demonstrates decreased signal within the right femoral head, representing fluid, and increased signal within the left femoral head, representing blood. Differences in signal intensity between the femoral heads in patients with bilateral avascular necrosis are common and reflect the fact that, although prone to bilateral disease, onset in each hip occurs separately and progresses at a different rate. See also the next image. Coronal T2-weighted magnetic resonance image of the pelvis in a patient with bilateral avascular necrosis of the femoral head shows decreased signal within the right femoral head, representing fluid, and increased signal within the left femoral head, representing blood. The right hip has a class C lesion, and the left hip has a class B lesion. A coronal T1-weighted magnetic resonance image of a patient who complained of a short onset of right hip pain. There is now diffuse low signal involving the lateral aspect of the right femoral head. See also the next image. A coronal FS T2-weighted magnetic resonance image (MRI) taken 2 years later from a patient who complained of a short onset of right hip pain. There is diffuse marrow edema (bright white signal) in the right femoral neck and head. There is also a focus of decreased (dark) signal in the superomedial aspect of the right femoral head, probably related to fibrous tissue. There is now a well-defined focus of dark signal indicating avascular necrosis of the left femoral head (arrow). There is no double line sign, which is often the case on FS T2-weighted MRIs. A frequency selective pulse was not used. The inner border of the peripheral band demonstrates high signal. This may represent chemical shift artifact, because the position of the signal changes when the phase and frequency directions are changed. This is termed the double-line sign and is pathognomonic for avascular necrosis (see the first image below). It is present in 80% of cases. This is not demonstrated well on FSE T2WIs because of the increased signal intensity of fat, present on this sequence, which obscures the bright inner line (see the second image below). To compensate, a frequency selective pulse is added to suppress the signal from fat. If fat suppression is used, the dark outer peripheral band of AVN is not demonstrated well, in contrast to the inner high-signal band visualized on this sequence. The outer low-signal ring represents the interface of repair tissue with the necrotic zone. Coronal T2-weighted magnetic resonance image in a patient with avascular necrosis of the femoral head shows the double-line sign within the left femoral head, which is pathognomonic for avascular necrosis. The inner margin of the border of the abnormality is believed to represent a chemical shift artifact. If intravenous contrast is used to supplement the MRI examination, areas of decreased enhancement indicate early AVN despite normal findings on pre-enhancement images. Contrast enhancement is useful for distinguishing viable from nonviable trabeculae and marrow. Nonviable tissue does not enhance after contrast administration. Enhancement of the low-signal band on T1WIs corresponds to the reparative zone. Avascular necrosis occasionally appears as an area of abnormal signal involving the femoral head, neck, and intertrochanteric region. It is characterized by decreased signal on T1WIs and increased signal on T2WIs without the focal lesions that are pathognomonic for AVN. This is termed the bone marrow edema pattern, as the signal characteristics are consistent with increased free water or edema within the normal fatty marrow of the proximal femur. This may reflect early edema before the onset of focal abnormalities and may indicate the time period between cell death and development of a significantly large reactive interface, which is recognizable as AVN on MRIs. When using subchondral marrow changes on T2WIs or contrast-enhanced T1WIs to differentiate transient from irreversible AVN lesions, the absence of low-signal subchondral lesions and subchondral deformities in the presence of the bone marrow edema pattern represents transient osteoporosis. Areas of low signal intensity in the subchondral region and contour deformities of the femoral head are typical of AVN. Fatty conversion of marrow is a prerequisite for developing AVN of the femoral head, a finding that may help identify populations at increased risk for developing the disease. Subchondral fractures may appear as a low signal intensity gap on T1WIs; on T2WIs, they can appear as regions of high signal intensity, representing fluid within the fracture line. Joint effusions are present in 50% of patients (see the following images). In class A AVN, central osteonecrotic focus signal analogous to that of fat is noted. Increased signal is demonstrated on T1WIs, and intermediate to high signal is demonstrated on T2WIs (see the image below). Coronal T1-weighted magnetic resonance image (MRI) of the pelvis in a patient with avascular necrosis of the femoral head shows increased signal within the superior aspect of the femoral head, representing fat. This is an MRI class 1 hip. These patients may have more than one type of signal within the abnormal avascular area. In this situation, the most dominant signal is used for MRI classification. In class B AVN, the presence of central osteonecrotic focus signal analogous to that of blood is observed. Increased signal is demonstrated on both T1WIs and T2WIs (see the following images). In class C AVN, central osteonecrotic focus signal analogous to that of fluid is present. Decreased signal is demonstrated on T1WIs, and increased signal is demonstrated on T2WIs (see the 2 images above, and the images below). In class D AVN, the presence of central osteonecrotic focus signal analogous to that of fibrous tissue is noted. Decreased signal is demonstrated on both T1WIs and T2WIs. 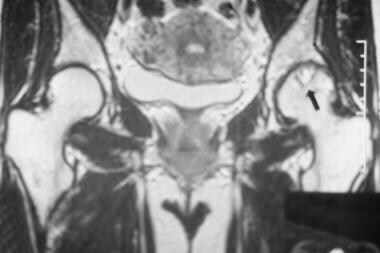 MRI classes A and D show the best correlation with radiographic staging. Approximately 50% of radiographic stage 1 and 83% of radiographic stage 2 lesions demonstrate MRI class A signal pattern. In femoral heads complicated by fracture (radiographic stages 3 and 4), only 14% are MRI class A and 43% MRI class B.
MRI class B and C lesions correlate poorly with radiographic staging. Of patients with MRI class A lesions, 54% are asymptomatic. Of patients with MRI classes B and C lesions, 11% are asymptomatic. Of patients with MRI class D lesions, 67% are asymptomatic. MRI classes, unlike radiographic stages, have little predictive value regarding prognosis for femoral head collapse. Entirely circumscribed AVN that did not extend to the subchondral margin had a good outcome, independent of the overall size of the lesion. The percentage of the weightbearing surface occupied by the lesion was the most reliable factor in predicting outcome. Basing outcome on overall extent of involvement of the femoral head on MRI is controversial. Lafforgue et al evaluated 3 different means of determining femoral head involvement and found that the percentage of weightbearing femoral cortex involved with AVN was the most reliable parameter in determining outcomes. Beltran et al found that femoral head collapse occurs in most patients with a large area of avascular necrosis (AVN) before the appearance of a subchondral fracture, even if core decompression is performed. Using MRI, the investigators determined femoral head collapse did not occur when less than 25% of the weightbearing surface was involved. MRI has a high sensitivity in the diagnosis of bone marrow abnormalities; the sensitivity of MRI in the diagnosis of avascular necrosis (AVN) is 85-100%. MRI has a 97% sensitivity in distinguishing a hip with AVN involvement from a normal hip. In differentiating AVN from non-AVN disease of the femoral head, MRI demonstrates a sensitivity of 98% and a specificity of 85%. Before femoral head collapse, the specificity is 75-100%. After femoral head collapse, the sensitivity is 100%. In a retrospective analysis of the possible predictive ability of contrast-enhanced MRI for AVN after closed reduction for developmental dysplasia of the hip (DDH) in infants, Tiderius et al suggested that gadolinium-enhanced MRI provides accurate anatomic assessment of a closed reduction in DDH as well as information about femoral head perfusion that may be predictive for future AVN. Multivariate logistic regression indicated that a global decreased enhancement was associated with a significantly higher risk of developing AVN. However, the authors noted that further investigation is required before perfusion information can be used for routine clinical use. Bone marrow edema is a nonspecific finding seen in avascular necrosis and other conditions that may progress to frank AVN (see the images below). 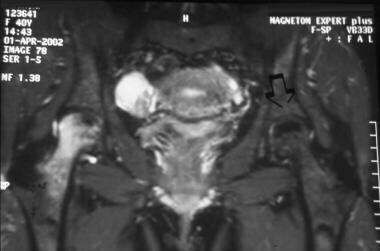 A coronal T2-weighted magnetic resonance image of a patient who complained of a short onset of right hip pain. The study is normal. See also the next image. TOP is a self-limiting condition characterized by osteoporosis of the femoral head and, occasionally, the femoral neck. TOP resolves over a 4- to 10-month period, and it does not progress to avascular necrosis. TOP often can appear on both sides of the hip joint, differentiating it from AVN. Similar findings can develop in the contralateral hip or other joints, in which case it is termed regional migratory osteoporosis. TOP occurs in patients without the risk factors for AVN. Transient bone marrow syndrome is similar to TOP, but osteoporosis is never present radiographically. Symptoms are self-limiting, and it occurs in patients who have no risk factors for AVN. A bone bruise is usually self-limiting and resolves over time. If bone marrow edema is present on MRI, plain radiography is obtained. If plain film findings are normal, radiography should be repeated within 4-6 weeks. If osteoporosis is detected, it is believed to represent TOP. If osteoporosis is absent, patients may be placed into groups with and without high-risk factors for developing AVN. Patients with factors indicating a low index of suspicion can be treated conservatively, but plain radiography and MRI follow-up imaging should be performed. High-risk patients should be considered candidates for surgical intervention. A cold spot (photon-deficient region) within the femoral head is highly specific for avascular necrosis and is the earliest scintigraphic evidence of this disease. The finding is usually seen 7-10 days after the ischemic event. Over a period of weeks to months, increased uptake representing revascularization and repair surrounds and eventually replaces the region of photopenia. The central region of photopenia with surrounding zone of increased uptake is termed the doughnut sign. Initially, uptake is decreased in the perfusion and static phases, which represents the early ischemic event. Later, uptake is decreased within the femoral head in the perfusion phase and increased around the cold region in the static phase. The latter represents the reactive zone around the infarcted segment. The increased uptake from the reparative zone eventually replaces the photopenic region. Hungerford reported false-negative bone scans in the hips of 14 of 27 patients, 13 of whom had bilateral disease. In patients with bilateral involvement, the uptake, although symmetric, really is increased bilaterally. If the uptake is asymmetric, the side affected more severely makes the less-involved side appear falsely normal. Later in the course of the disease, between the time of infarct and revascularization, the scan appears falsely normal in 6-10% of patients, or it demonstrates a pattern of uptake that cannot be differentiated from DJD. Decreased uptake, indicative of early avascular necrosis, can also be seen in infection, plasma cell myeloma, skeletal metastasis, hemangioma, and radiation therapy. 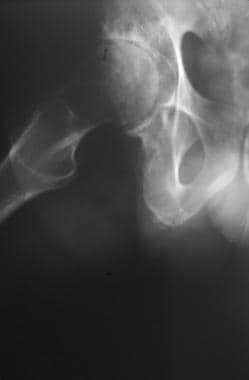 Increased uptake alone can be seen in arthritis, sympathetic dystrophy, malignancy, infection, transient osteoporosis of the hip (TOP), hemangioma, and insufficiency fractures. TOP can cause increased uptake on both sides of the hip joint. Karantanas AH. Accuracy and limitations of diagnostic methods for avascular necrosis of the hip. Expert Opin Med Diagn. 2013 Mar. 7 (2):179-87. [Medline]. Manenti G, Altobelli S, Pugliese L, Tarantino U. 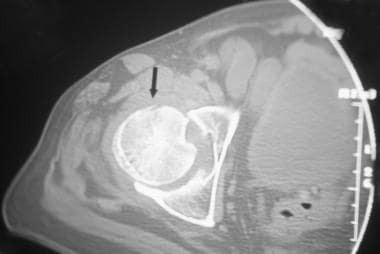 The role of imaging in diagnosis and management of femoral head avascular necrosis. Clin Cases Miner Bone Metab. 2015 Jan-Apr. 12 (Suppl 1):31-8. [Medline]. Barille MF, Wu JS, McMahon CJ. Femoral head avascular necrosis: a frequently missed incidental finding on multidetector CT. Clin Radiol. 2014 Mar. 69 (3):280-5. [Medline]. Shah KN, Racine J, Jones LC, Aaron RK. Pathophysiology and risk factors for osteonecrosis. Curr Rev Musculoskelet Med. 2015 Sep. 8 (3):201-9. [Medline]. Murphey MD, Roberts CC, Bencardino JT, Appel M, Arnold E, Chang EY, et al. ACR Appropriateness Criteria Osteonecrosis of the Hip. J Am Coll Radiol. 2016 Feb. 13 (2):147-55. [Medline]. Agrawal K, Marafi F, Gnanasegaran G, Van der Wall H, Fogelman I. Pitfalls and Limitations of Radionuclide Planar and Hybrid Bone Imaging. Semin Nucl Med. 2015 Sep. 45 (5):347-72. [Medline]. Ando W, Yamamoto K, Koyama T, Hashimoto Y, Tsujimoto T, Ohzono K. Radiologic and Clinical Features of Misdiagnosed Idiopathic Osteonecrosis of the Femoral Head. Orthopedics. 2017 Jan 1. 40 (1):e117-e123. [Medline]. Boraiah S, Dyke JP, Hettrich C, Parker RJ, Miller A, Helfet D, et al. Assessment of vascularity of the femoral head using gadolinium (Gd-DTPA)-enhanced magnetic resonance imaging: a cadaver study. J Bone Joint Surg Br. 2009 Jan. 91(1):131-7. [Medline]. Theysohn JM, Kraff O, Theysohn N, Orzada S, Landgraeber S, Ladd ME, et al. Hip imaging of avascular necrosis at 7 Tesla compared with 3 Tesla. Skeletal Radiol. 2014 May. 43 (5):623-32. [Medline]. Ficat RP, Arlet J. Functional investigation of bone under normal conditions. In: Hungerford DS, ed. Ischemia and Necrosis of Bone. Baltimore:. Lippincott Williams & Wilkins. 1980:29. Manaster BJ. From the RSNA Refresher Courses. Radiological Society of North America. 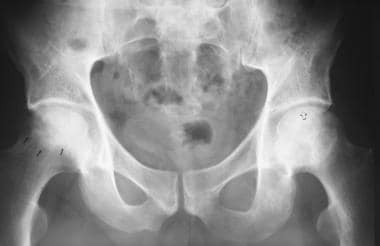 Adult chronic hip pain: radiographic evaluation. Radiographics. 2000 Oct. 20 Spec No:S3-S25. [Medline]. Napora JK, Gilmore A, Son-Hing JP, Grimberg DC, Thompson GH, Liu RW. Early MRI Detection and Closed Bone Graft Epiphysiodesis May Alter the Course of Avascular Necrosis Following Unstable Slipped Capital Femoral Epiphysis. J Pediatr Orthop. 2016 Jun 2. [Medline]. Beltran J, Burk JM, Herman LJ, et al. 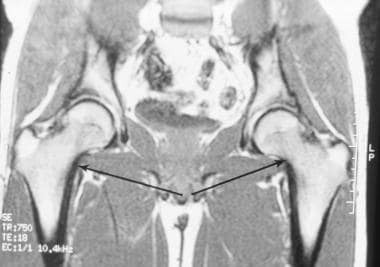 Avascular necrosis of the femoral head: early MRI detection and radiological correlation. Magn Reson Imaging. 1987. 5(6):431-42. [Medline]. Oshima M, Yoshihasi Y, Ito K, et al. Initial stage of Legg-Calve-Perthes disease: comparison of three-phase bone scintigraphy and SPECT with MR imaging. Eur J Radiol. 1992 Sep. 15(2):107-12. [Medline]. Mueller D, Schaeffeler C, Baum T, Walter F, Rechl H, Rummeny EJ, et al. Magnetic resonance perfusion and diffusion imaging characteristics of transient bone marrow edema, avascular necrosis and subchondral insufficiency fractures of the proximal femur. Eur J Radiol. 2014 Oct. 83 (10):1862-9. [Medline]. Gornitzky AL, Georgiadis AG, Seeley MA, Horn BD, Sankar WN. Does Perfusion MRI After Closed Reduction of Developmental Dysplasia of the Hip Reduce the Incidence of Avascular Necrosis?. Clin Orthop Relat Res. 2016 May. 474 (5):1153-65. [Medline]. Collier BD, Krasnow AZ, Hellman RS. SPECT bone scanning. In: Collier BD, Fogelman I, Rosenthal L, eds. Skeletal Nuclear Medicine. St. Louis, Mo:. Mosby. 1996. Collier BD, Carrera GF, Johnson RP, et al. Detection of femoral head avascular necrosis in adults by SPECT. J Nucl Med. 1985 Sep. 26(9):979-87. [Medline]. Lee MH, Moon DH, Na HW. Diagnosis of femoral head avascular necrosis by triple head high resolution. J Nucl Med. 1992. 33:936. Gayana S, Bhattacharya A, Sen RK, Singh P, Prakash M, Mittal BR. F-18 fluoride positron emission tomography/computed tomography in the diagnosis of avascular necrosis of the femoral head: Comparison with magnetic resonance imaging. Indian J Nucl Med. 2016 Jan-Mar. 31 (1):3-8. [Medline]. Agarwal KK, Mukherjee A, Sharma P, Bal C, Kumar R. Incremental value of 99mTc-MDP hybrid SPECT/CT over planar scintigraphy and SPECT in avascular necrosis of the femoral head. Nucl Med Commun. 2015 Oct. 36 (10):1055-62. [Medline]. Thrall JH, Ziessman HA. The skeletal system. Thrall JH, Ziessman HA, eds. Nuclear Medicine: The Requisites. 2nd ed. St Louis, Mo: Mosby; Mosby. 2001: 133. Kubota S, Inaba Y, Kobayashi N, Tateishi U, Ike H, Inoue T, et al. Prediction of femoral head collapse in osteonecrosis using 18F-fluoride positron emission tomography. Nucl Med Commun. 2015 Jun. 36 (6):596-603. [Medline]. Hofman S, Staudennkerg A, Breitenseker M, et al. Diagnostic patterns for bone marrow edema syndrome and avascular necrosis of the femoral head in dynamic bone scintigraphy. Nucl Med Commentary. 1997. 18 (12):1178. Maillefert JF, Toubeau M, Piroth C, et al. 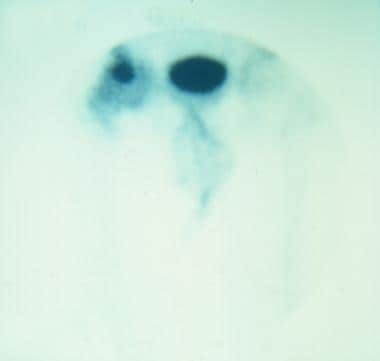 Bone scintigraphy equipped with a pinhole collimator for diagnosis of avascular necrosis of the femoral head. Clin Rheumatol. 1997 Jun. 16(4):372-7. [Medline]. 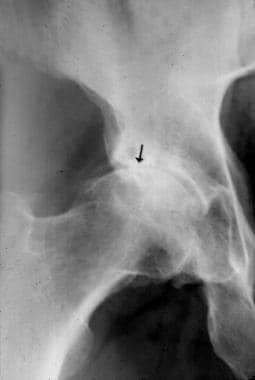 Ficat RP, Arlet J. Necrosis of the femoral head. In: Hungerford DS, ed. Ischemia and Necrosis of Bone. Lippincott Williams & Wilkins. 1980:171. Steinberg ME, Hayken GD, Steinberg DR. A quantitative system for staging avascular necrosis. J Bone Joint Surg Br. 1995 Jan. 77(1):34-41. [Medline]. Sarikaya I, Sarikaya A, Holder LE. The role of single photon emission computed tomography in bone imaging. Semin Nucl Med. 2001 Jan. 31(1):3-16. [Medline]. Lee GC, Steinberg ME. Are we evaluating osteonecrosis adequately?. Int Orthop. 2012 Dec. 36(12):2433-9. [Medline]. [Full Text]. Karantanas AH, Drakonaki EE. The role of MR imaging in avascular necrosis of the femoral head. Semin Musculoskelet Radiol. 2011 Jul. 15(3):281-300. [Medline]. Gruson KI, Kwon YW. Atraumatic osteonecrosis of the humeral head. Bull NYU Hosp Jt Dis. 2009. 67(1):6-14. [Medline]. Khanna AJ, Yoon TR, Mont MA, Hungerford DS, Bluemke DA. Femoral head osteonecrosis: detection and grading by using a rapid MR imaging protocol. Radiology. 2000 Oct. 217(1):188-92. [Medline]. Lee JH, Dyke JP, Ballon D, Ciombor DM, Tung G, Aaron RK. Assessment of bone perfusion with contrast-enhanced magnetic resonance imaging. Orthop Clin North Am. 2009 Apr. 40(2):249-57. [Medline]. [Full Text]. Lafforgue P, Dahan E, Chagnaud C, et al. Early-stage avascular necrosis of the femoral head: MR imaging for prognosis in 31 cases with at least 2 years of follow-up. Radiology. 1993 Apr. 187(1):199-204. [Medline]. Beltran J, Knight CT, Zuelzer WA, et al. Core decompression for avascular necrosis of the femoral head: correlation between long-term results and preoperative MR staging. Radiology. 1990 May. 175(2):533-6. [Medline]. Chan TW, Dalinka MK, Steinberg ME, et al. MRI appearance of femoral head osteonecrosis following core decompression and bone grafting. Skeletal Radiol. 1991. 20(2):103-7. [Medline]. Kruczynski J. Avascular necrosis of the proximal femur in developmental dislocation of the hip. Incidence, risk factors, sequelae and MR imaging for diagnosis and prognosis. Acta Orthop Scand Suppl. 1996 Apr. 268:1-48. [Medline]. May DA, Disler DG. 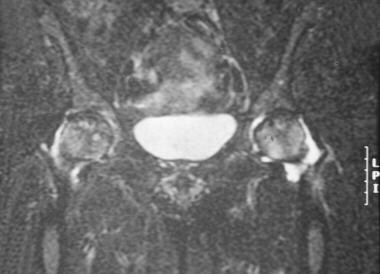 Screening for avascular necrosis of the hip with rapid MRI: preliminary experience. J Comput Assist Tomogr. 2000 Mar-Apr. 24(2):284-7. [Medline]. Olscamp AJ, Tao SS, Savolaine ER, Ebraheim NA. Postoperative magnetic resonance imaging evaluation of Pipkin fractures fixated with titanium implants: a report of two cases. Am J Orthop. 1997 Apr. 26(4):294-7. [Medline]. Stoller DW, Maloney WJ, Glick JM. The hip. In: Stoller DW, ed. Magnetic Resonance Imaging in Orthopedics and Sports Medicine. Philadelphia:. Lippincott Williams & Wilkins. 1997:97, 132. Takatori Y, Kokubo T, Ninomiya S, et al. 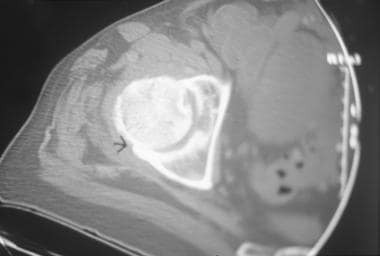 Avascular necrosis of the femoral head. Natural history and magnetic resonance imaging. J Bone Joint Surg Br. 1993 Mar. 75(2):217-21. [Medline]. Vande Berg BE, Malghem JJ, Labaisse MA, et al. MR imaging of avascular necrosis and transient marrow edema of the femoral head. Radiographics. 1993 May. 13(3):501-20. [Medline]. Shimizu K, Moriya H, Akita T. Prediction of collapse with magnetic resonance imaging of avascular necrosis of the femoral head. JBJS (AM). 1994. 76:215-233. Tiderius C, Jaramillo D, Connolly S, Griffey M, Rodriguez DP, Kasser JR, et al. Post-closed reduction perfusion magnetic resonance imaging as a predictor of avascular necrosis in developmental hip dysplasia: a preliminary report. J Pediatr Orthop. 2009 Jan-Feb. 29(1):14-20. [Medline]. Yeh LR, Chen CK, Huang YL, Pan HB, Yang CF. Diagnostic performance of MR imaging in the assessment of subchondral fractures in avascular necrosis of the femoral head. Skeletal Radiol. 2009 Jun. 38(6):559-64. [Medline]. Spencer RP, Lee YS, Sziklas JJ, et al. Failure of uptake of radiocolloid by the femoral heads: a diagnostic problem: concise communication. J Nucl Med. 1983 Feb. 24(2):116-8. [Medline]. Hungerford DS. Pathogenetic considerations in ischemic necrosis of bone. Can J Surg. 1981 Nov. 24(6):583-7, 590. [Medline]. Imhof H, Breitenseher M, Trattnig S, et al. Imaging of avascular necrosis of bone. Eur Radiol. 1997. 7(2):180-6. [Medline]. Lee MJ, Corrigan J, Stack JP, et al. A comparison of modern imaging modalities in osteonecrosis of the femoral head. Clin Radiol. 1990 Dec. 42(6):427-32. [Medline]. Murray IP. The role of SPECT in the evaluation of skeletal trauma. Ann Nucl Med. 1993 Feb. 7(1):1-9. [Medline]. Naito M, Ogata K, Moriguchi H. Quantitative bone scanning of the hip. Comparison between the perfusion and static phases. Int Orthop. 1996. 20(5):311-4. [Medline]. Conway JJ. A scintigraphic classification of Legg-Calve-Perthes disease. Semin Nucl Med. 1993 Oct. 23(4):274-95. [Medline]. Staudenherz A, Hofmann S, Breitenseher M, et al. Diagnostic patterns for bone marrow oedema syndrome and avascular necrosis of the femoral head in dynamic bone scintigraphy. Nucl Med Commun. 1997 Dec. 18(12):1178-88. [Medline]. Bluemke DA. 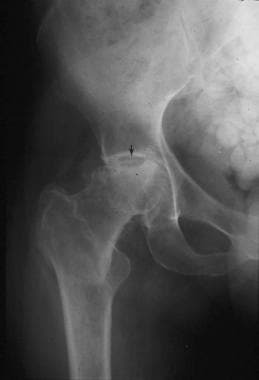 Avascular necrosis of the hip: MR evaluation. Contemp Diagn Radiol. 1996. 19:23. Bluemke DA, Zerhouni EA. 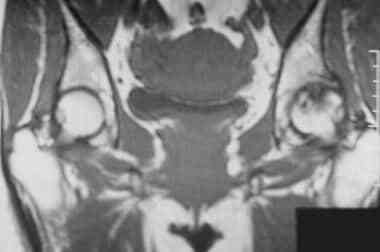 MRI of avascular necrosis of bone. Top Magn Reson Imaging. 1996 Aug. 8(4):231-46. [Medline]. Hays CW, Conway WF, Daniel WW. MR imaging of bone marrow edema pattern; transient osteoporosis, transient bone marrow edema syndrome or osteonecrosis. Radiographics. 1993. 13:1001. Kopecky KK, Braunstein EM, Brandt KD, et al. Apparent avascular necrosis of the hip: appearance and spontaneous resolution of MR findings in renal allograft recipients. Radiology. 1991 May. 179(2):523-7. [Medline]. Quinn SF, McCarthy JL. Prospective evaluation of patients with suspected hip fracture and indeterminate radiographs: use of T1-weighted MR images. Radiology. 1993 May. 187(2):469-71. [Medline]. Vande Berg B, Malghem J, Labaisse MA, et al. Avascular necrosis of the hip: comparison of contrast-enhanced and nonenhanced MR imaging with histologic correlation. Work in progress. Radiology. 1992 Feb. 182(2):445-50. [Medline]. Vande Berg BC, Malghem JJ, Lecouvet FE, et al. Idiopathic bone marrow edema lesions of the femoral head: predictive value of MR imaging findings. Radiology. 1999 Aug. 212(2):527-35. [Medline]. Association Research Circulation Osseous. Committee on Terminology and Classification. ARCO News. 1992. 4:41-6. Blumhagen J. Legg-Calve-Perthes disease. In: Hilton SW, Edwards DK, eds. Practical Pediatric Radiology. 2nd ed. Philadelphia:. WB Saunders Co. 1994:485. Pavelka K. Osteonecrosis. Baillieres Best Pract Res Clin Rheumatol. 2000 Jun. 14(2):399-414. [Medline]. Resnick D, Niwayama G. Osteonecrosis: diagnostic techniques, special situations and complications. In: Resnick D, ed. Diagnosis of Bone and Joint Disorders. Philadelphia:. WB Saunders Co. 1995:3495. Roshan A, Ram S. The neglected femoral neck fracture in young adults: review of a challenging problem. Clin Med Res. 2008 May. 6(1):33-9. [Medline]. Beuther E. Disorders of hematopiesis. Fauci A, Braunwalldt E, Isselbacker KJ, et al, eds. Harrison's Principles of Internal Medicine. 14th ed. New York, NY: McGraw-Hill; 1998. 647. Boechat MI, Winters WD, Hogg RJ, et al. Avascular necrosis of the femoral head in children with chronic renal disease. Radiology. 2001 Feb. 218(2):411-3. [Medline]. Ohzono K, Saito M, Sugano N, et al. The fate of nontraumatic avascular necrosis of the femoral head. A radiologic classification to formulate prognosis. Clin Orthop. 1992 Apr. (277):73-8. [Medline]. Sweet DE, Madwell JE. Osteonecrosis: pathogenesis. Resnick D, ed. Diagnosis of Bone and Joint Disorders. Philadelphia, Pa: WB Saunders Co; 1995. 3447, 3457-58, 3460, 3463, 3465.